Last night our family drove out to the pumpkin patch and filled the John Deere Gator with pumpkins of all shapes and sizes. I spent the morning getting inspired by my coworkers Adam and Sabine. We joined creative forces and the result was a handful of surprisingly simple ways to transform my porch. I hope you will give a few of these of these decorating ideas a try. My porch looks cuter than EVER if I do say so myself! 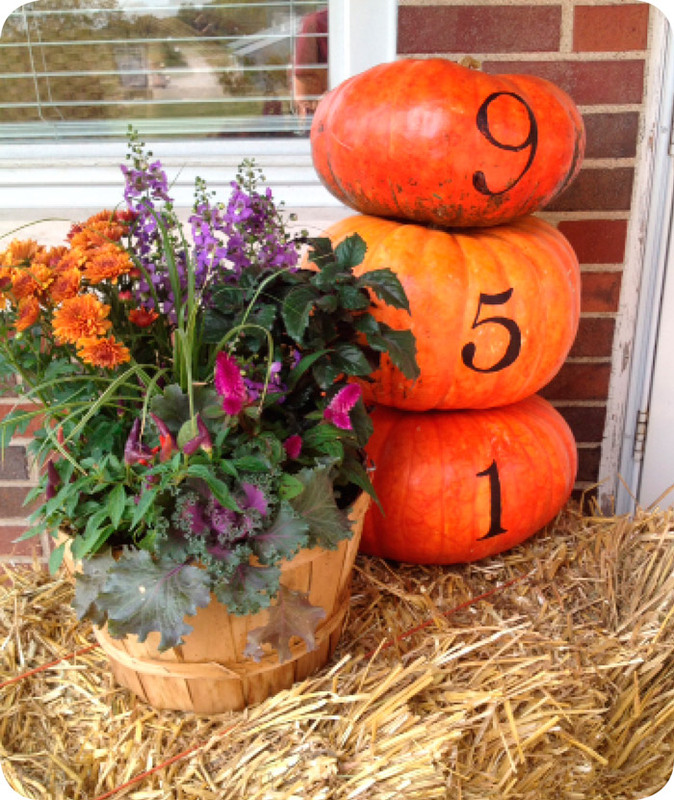 Owl Pumpkin TIP: Use thumb tacks to secure burlap flowers and leaves. Hot-glued pine cones are a fun addition for ears. 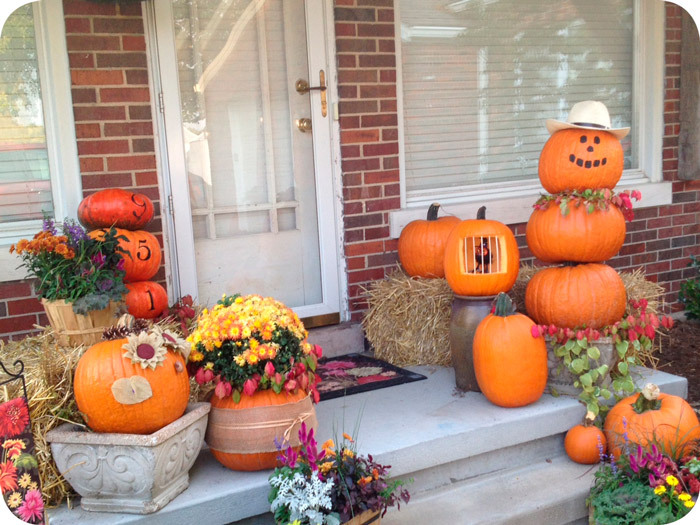 Scarecrow Pumpkin Stack TIP: Trim the stems for better pumpkin stacking. Use a paint marker to create the face. Dress him up with burning bush branches and a festive hat! We used thumb tacks to secure the hat. Take it a step further by adding stalks of dried corn or small brooms for arms. 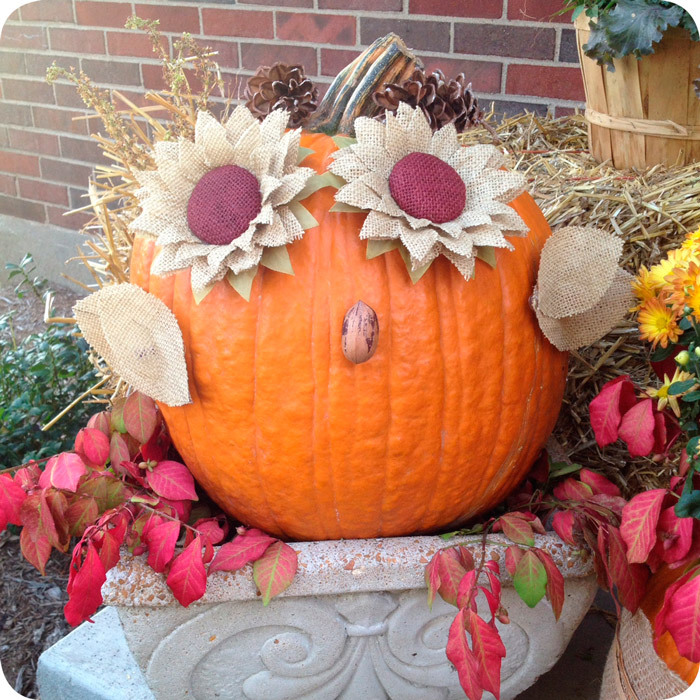 Mum in a Carved Pumpkin TIP: A little burlap and raffia add some fall flair to the classic mum. After our spirited decorating escapade, we returned to the cooking classroom to roast the seeds from our carvings. Sabine shared a savory version of pumpkin seeds and we all fell in love. She served the seeds in a pumpkin of course! Preheat oven to 350 degrees F. While seeds are still moist, toss with remaining ingredients to coat. Spread evenly on a rimmed baking sheet and bake until browned. About 10 minutes.